Ragunan Zoo is a zoo located in the area Ragunan, Sunday Market, South Jakarta, Indonesia. An area of ​​140 hectare zoo was founded in 1864. In it, there are various collection consisting of 295 species and 4040 specimens. Ragunan was closed for about three weeks since 19 September 2005 because of the animals in which there are infected with bird flu, but reopened on October 11 until now. 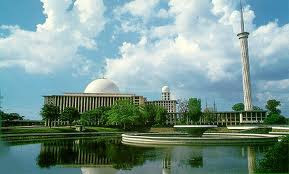 Taman Mini Indonesia Indah (TMII) is a cultural theme park attractions in East Jakarta Indonesia. An area of ​​approximately 250 square kilometers is located at coordinates 6 ° 18? 6.8? LS, 106 ° 53? 47.2? BT. This park is a summary of the national culture of Indonesia, which covers various aspects of daily life of people 26 provinces of Indonesia (in 1975) is displayed in the pavilion area of ​​traditional architecture, seta featuring various fashions, dances and traditions of the region. 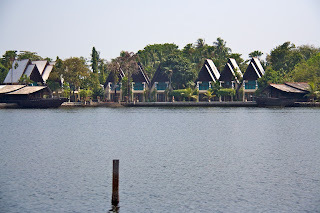 In addition, in the middle of TMII, there is a lake which depict miniature archipelago of Indonesia in its center, cable car, various museums, and the IMAX Theatre and the Theatre Keong Mas my homeland), a variety of recreational facilities makes TMIII as one of the leading tourist areas in the capital city ​​of Jakarta. 1. 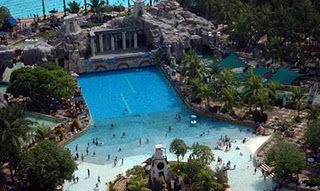 Beaches and Parks Acnol are amusement rides that offer freshness of the beach for all people and ages. Beaches and Parks has 5 beach (Beach Festival, Beautiful, Elegant, Ria and Carnival Beach Club) and Dream Lake, along approximately 5 km, with a promenade along the 4 km. 2. 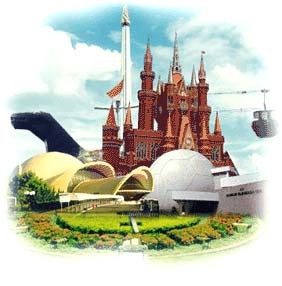 Ancol Fantasy World, which opened to the public on August 29, 1986, and popular with the title Dufan, is the first theme park developed by Ancol. Dufan is the largest outdoor entertainment center in Indonesia that pamper visitors with Fantasy Around the World, through a variety of rides games high-tech content, which is divided into eight areas, namely: Indonesia, Jakarta, Asia, Europe, America, Greece, and Balada Kera Tale. 3. 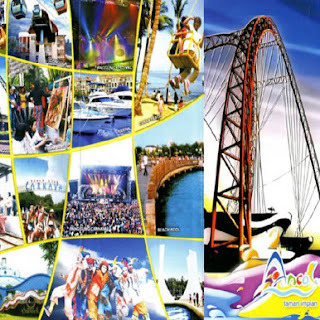 Atlantis Water Adventure (AWA) is a second theme park developed by Ancol and stands on an area of ​​5 hectares. AWA is the result of the revitalization of Park Recreation Centre Ancol Water Arena which will give visitors an adventure water attractions with 8 main pool, namely: Poseidon, Antilles, Plaza Atlas, Aquarius, Octopus, Atlantean, and Kiddy Pool. 4. 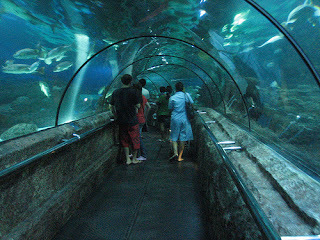 Ancol Ocean Arena ("Ocean") is the third theme park developed by Anco. 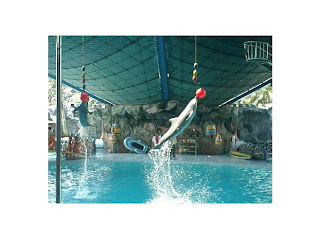 Ocean is an edutainment theme park nuanced nature conservation which gives to the visitor experience to know better and loving creatures, including dolphins, white whales, seals, etc. 5. 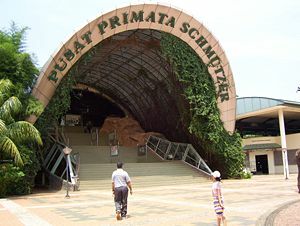 Sea World is the first underwater aquarium and the only one in Indonesia, with an area of ​​2 hectares (managed by BOT format). 6. 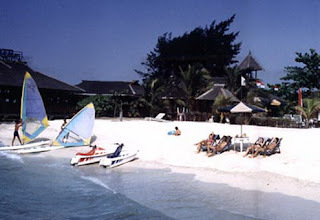 Mermaid Cottages Lodging Ancol beach cottages form a unique style with 133 rooms has a variety of specialized facilities, such as: function room, meeting room and a beach party location. Mermaid also offers sports facilities, such as a swimming pool, table tennis, bicycles, tennis courts, beach volleyball and lapanan. Ancol Mermaid artistic architecture with a thick blend of style and romance posmo Eastern Indonesia, arranged in harmony with the coastal environment to create a tasteful and exotic atmosphere. 7. 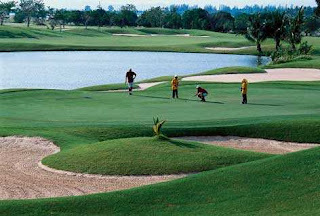 Golf nuanced Ancol beach in the middle of the tourist area which has 18 holes with a unique design field. Strategically located and easily accessible from all parts of Jakarta. 8. Marina Wharf cruise ship (speed boat and yacht) cosmopolitan style of the first and most comprehensive in Indonesia, designed to cruise ship berths of various sizes. 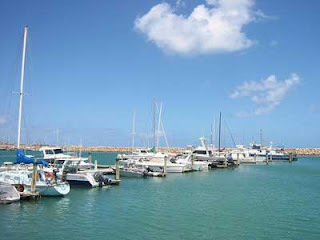 Marina also serves as a center for sea sports, water skiing, wind surfing, diving, sailing, harbor cruises and to get to the Thousand Islands. Marina is equipped with fasilitias dock, marine band, gas stations, docks loading and unloading, travel agents and nautical sports. 9. Ancol Art Market - a center of arts and crafts activities that provide inspiration and insight for art lovers and collectors. Art market is a concrete manifestation Ancol concern over the viability of talented artists. Art Market also features an exhibition gallery (North Art Space / NAS), Souvenir Shop, Plaza and the Performing Arts Stage. 10. 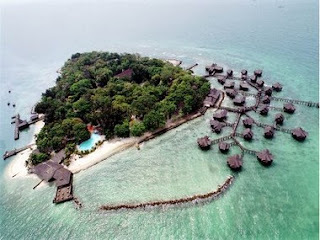 Ancol An Angel Island to the middle island in the Thousand Islands that can be taken within 20 minutes from the Marina. Angel Island has 49 cottages consisting of 23 units of deluxe type, 20 types of family units, three units of the type of family suites, and 3 units of the type of suite and has a gym, two multi-purpose hall, restaurant, bar and souvenir shop. A unique attraction, which rides along swim with dolphins (swimming with the dolphin), can be enjoyed at Angel Island. Fatahillah Museum, also known as the Jakarta History Museum or the Museum of Batavia is a museum which is located at Jalan Taman Fatahillah No.. 2, West Jakarta with an area of ​​more than 1,300 square meters.Objects that can be found in this museum, among others, the history of Jakarta, replicas and relics of the Tarumanegara Pajajaran, results of archaeological excavations in Jakarta, antique furniture from the 17th century to 19, which is a blend of European style, People's Republic of China, and Indonesia. 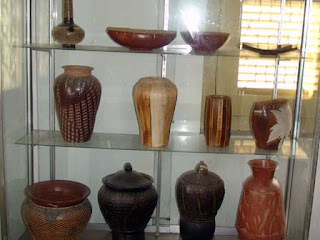 There are also ceramics, pottery, and stone inscriptions. These collections are located in various rooms, such as Jakarta Prehistoric Room, Room Tarumanegara, White Rose Room, Room Fatahillah, Sultan Agung Room, and Room MH Thamrin.There are also various collections of Betawi culture, numismatic, and pedicabs. Even now also placed statue of the god Hermes (according to Greek mythology, the god of luck and protection for the merchants), which was located at the intersection of Harmony and cannon robust Si is considered to have magical powers. 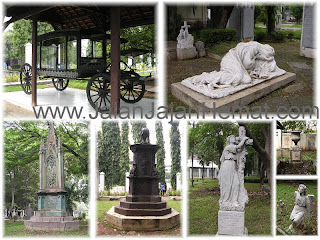 In addition, the Museum Fatahillah also a former dungeon which was once used in the Dutch colonial era. Textile Museum occupies the old building at Jalan K.S. Tubun / Petamburan No. 4 Tanah Abang, Central Jakarta. The building itself was originally the private home of a French citizen who built in the 19th century. Subsequently purchased by the Turkish consul named Abdul Aziz Al Katiri Almussawi who settled in Indonesia. 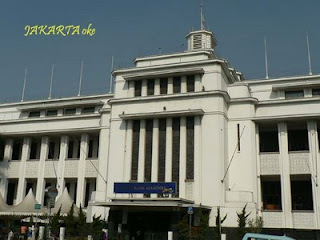 Subsequently in 1942 was sold to Dr. Karel Christian Cruq.In the struggle for Indonesian independence, this building became the headquarters of People's Security Front (BKR) in 1947 and inhabited by Lie Sion Pin. 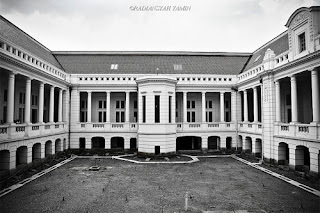 In 1952 and purchased by the Ministry of Social Affairs on October 25, 1975 submitted to the Government of DKI Jakarta that for later on June 28, 1976 inaugurated its use by Madame Tien Soeharto as the Textile Museum. Youth Pledge Museum is a museum of history of the struggle for independence of the Republic of Indonesia is located in Jalan Raya No. Kramat. 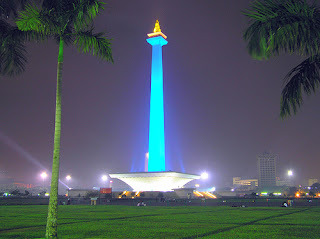 106, Central Jakarta and is managed by the Ministry of Culture and Tourism Republic of Indonesia. The museum was opened to the public, every Tuesday through Friday from 08:00 until 15:00 pm. For Saturday and Sunday open from at 08:00 to 14:00 pm. 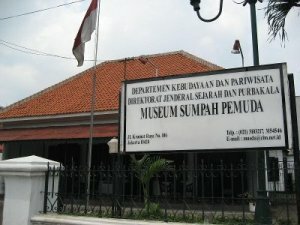 While every Monday and national holidays, the museum is closed to the public.This museum has a collection of photographs and objects relating to the history of the Youth Pledge of 1928, as well as the activities of the national movement of youth in Indonesia. Youth Pledge Museum was founded by the Decree of the Governor of Jakarta in 1972 and became the object of national cultural heritage. Maritime Museum is a museum that holds collections relating to maritime and kenelayanan nation of Indonesia from Sabang to Merauke, located across from the Port of Palm Sunda. Museum is one of eight museums that are under the supervision of the Office of the Provincial Museum of Culture Jakarta Special Capital Region.The collection is stored consists of various types of traditional boats with a variety of shapes, styles and ornaments, until the time of the VOC ship. There are also a variety of models and miniature modern vessels and equipment supporting shipping activities. Also the equipment used by sailors in the past such as navigation tools, anchors, binoculars, a model lighthouse and cannon.Maritime Museum also displays a collection of marine life, the data type and distribution of fish in the waters of Indonesia and various equipment as well as stories and songs of traditional fishing communities of the archipelago. The museum also displays the dimension of the Navy, a collection of cartography, mockups Onrust Island, maritime figures archipelago and boat trips KPM Batavia - Amsterdam. Building Museum Joang '45 or '45 is one of the museums in Jakarta. Currently management implemented by the Department of Culture and Museum of Jakarta. 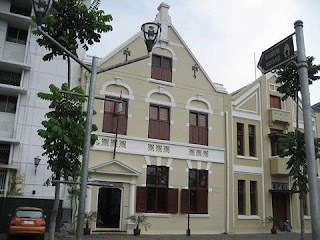 The museum is located at Jalan Menteng 31, Village Kebon Sirih, District of Menteng, Central Jakarta. 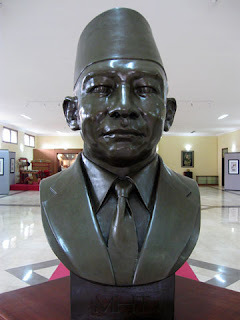 The museum was inaugurated in 1974 by President Soeharto, after being renovated.This can be seen in the museum traces the struggle of independence of Indonesia with a collection of relics of the warrior Indonesia. Among these are the official car of President and First Vice President who is known by car REP 1 and REP 2, and Car Bombing Incident in Cikini. In addition there is also a collection of photos of the documentation and paintings that depict the struggle around the year 1945-1950's. Some figures appear also in the form of struggle statues chest. Bank Mandiri Museum is located at Jl. Station No. field. 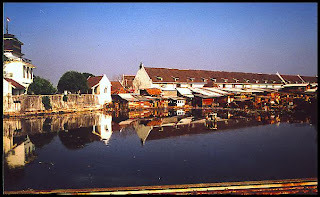 1, West Jakarta and is one part of the cultural heritage in the Old City of Jakarta. The museum collection consists of various collections related to banking activities "old days" and its development, a collection ranging from equipment owned bank operations, securities, currencies ancient (numismatic), brandkast, and others.Collection of operational equipment bank "old days" is unique, among others, lockbox, mechanical cash register, calculator, bookkeeping machines, printing machines, press tools bundle, seal press, safe deposit boxes and various securities such as deposit, deposit sertikat , checks, bonds, and stocks. In addition, the ornamentation of buildings, interiors and furniture Musuem is still original as when it was founded. 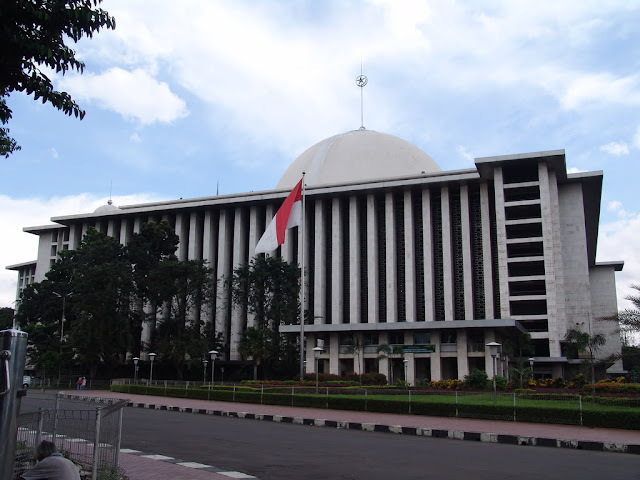 Bank Indonesia Museum is a museum in Jakarta, Indonesia which is located on Jl. Great Northern Door # 3, West Jakarta (the next station Beos City), with buildings occupying an area of ​​former City Bank Indonesia which is the heritage of cultural heritage wing de Javasche Bank neo-classical style, combined with local influence, and was first constructed in 1828 .This museum presents the information role of Bank Indonesia in the course of history of which began before the arrival of the west of the archipelago until the formation in 1953 of Bank Indonesia and Bank Indonesia's policies, including also the background and the impact of Bank Indonesia policy for the community until 2005. Presentation is packaged in such a way to utilize modern technology and multi media, such as electronic displays, static panel, plasma televisions, and thus creating on the scent enjoy the convenience of visitors in the Museum of Bank Indonesia. 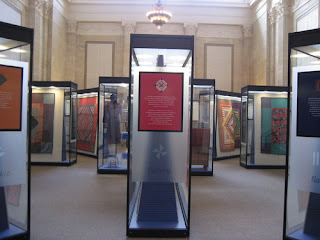 In addition there is also a fact and a collection of historic objects in the period before the establishment of Bank Indonesia, as in the kingdoms of the archipelago, which include money numismatic collection is displayed as well as attractive. ThamrinMohammad Hoesni Thamrin Building is a historical museum of the Republic of Indonesia's independence struggle in Jalan Kenari No. II. 15, Central Jakarta. 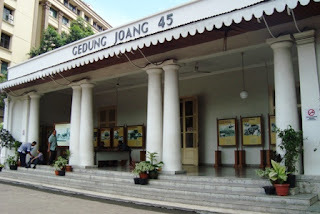 This museum has a collection of photo reproduction, radio and belongings, as well as the literature on gait struggle Mohammad Hoesni Thamrin in the Indonesian nationalist movement.Muhammad was the son wedana Hoesni Thamrin Thamrin Tabri who had worked in the office kepatihan Batavia and became member of the Volksraad (People's Council). Because the struggle to defend the people, he was arrested by the Dutch government and under house arrest until his death on January 11, 1941. Museum of Fine Arts and Ceramics is located at No 2 Jalan Pos Kota, West Jakarta Municipality, Province of DKI Jakarta, Indonesia. 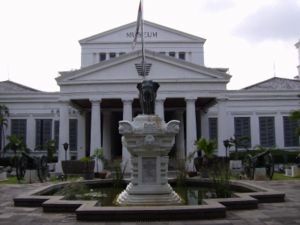 Museum is located exactly opposite the Jakarta History Museum is displaying a local ceramics from various regions in the country, from the era of the Majapahit Empire to the 14th century, and from various countries around the world. 1. F. Silaban the design of "Belief"
2. R. Oetoyo by design "Istighfar"
3. Hans Groenewegen by design "Greetings"
4. ITB students (5 persons) design "Ilham 5"
5. ITB Students (3 people) design "Chatulistiwa"After a long judging process by studying architectural design and its meaning contained therein based on the ideas of the participants then finally on July 5, 1955 by order of President Sukarno decided to design the draft with the title of "Belief" by Frederich Silaban selected as the winner as a model of the Istiqlal Mosque.Istiqlal Mosque Architect Christian ReligionFrederich Silaban is a Christian-born architect Bonandolok Sumatra, December 16, 1912, son of Jonas Silaban couple Nariaboru. He is one of the best graduates from the Academie van Amsterdam Bouwkunst 1950. besides making the Istiqlal mosque design he also designed the Senayan Sports Arena complex.To refine the design of Istiqlal mosque F. Silaban learn the rules of procedure and Muslims prayed and prayed for about 3 months and in addition he also learned a lot of literature about the mosques in the world.Early Development of the Istiqlal MosqueAt about 1950 until the end of the 1960s in front of the Wilhelmina Park Square Banteng known quiet, dark, dirty and unkempt. Walls of the fort Frederik Hendrik former buildings in the park filled with moss and thatch grass everywhere. Then in 1960, in the same place, thousands of people who come from all walks of ordinary people, civil servants, private, ecclesiastic and military work to clean unkempt gardens in the former colonial fort that.A year later, on August 24, 1961, still in the same month celebration of the independence of Indonesia, became the most historic date for the people, especially Muslims in Jakarta, and Indonesia generally. For the first time, in the former park, city of Jakarta has a large mosque. A mosque is meant as a symbol of independence for the Indonesian nation. Equivalent he said in Arabic means independence and agreed to be named Istiqlal, Istiqlal Mosque its name.The date coincides with the commemoration of the Birth of the Prophet Muhammad, was chosen as the moment of the first pole erection by the first President of Indonesia, Ir. Soekarno who was immediately acted as Head of Engineering.The length of the Istiqlal Mosque Development ProcessAlong with the domestic political climate heats up enough, the ambitious project was halting its construction, because it coincided with the construction of other monuments such as Gelora Senayan, National Monument, and various other lighthouse projects. Until the mid '60s disturbed Istiqlal Mosque project completion. Peak when the erupted event G 30 S / PKI year '65-'66, the construction of the Istiqlal Mosque even stopped altogether.Only when the Islamic Cultural Association of Artists miladnya which commemorates the 20th, a number of leaders, scholars and state officials moved to continue the development of the Istiqlal Mosque. Spearheaded by the Ministry of Religious KH. M. Dahlan fundraising efforts intensified to realize the physical mosque again. President Sukarno, the prestige in the eyes of the community began to wear off, its place in the management was replaced by KH. 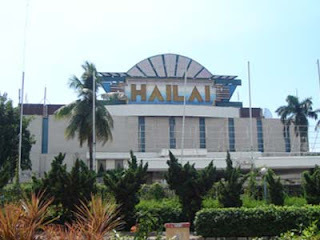 Idham Chalied which acts as the coordinator of the national committee a new Istiqlal Mosque. Through the stewardship of a new, modern style with the architecture of the mosque was completed well construction.Original construction of the mosque direncanakn will take as long as 45 years but its implementation was much faster. The main building can be completed within six years, exactly on the date of August 31, 1967 can already be used is marked by the first berkumandangnya Maghrib prayer.Overall Istiqlal mosque completed within a period of 17 years. 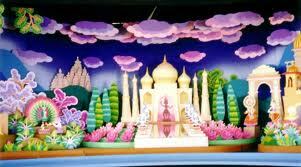 Opening made by the president Soeharto on February 22, 1978. Period of development has gone through two periods of the leadership of the Old Order and New Order. Funding the construction of this mosque in the Old Order Mandate is realized through the project while in the New Order became part of the Project Repelita (Five Year Development Plan). Istiqlal mosque now stands majestically in the capital city of Jakarta and become the pride of the whole people of Indonesia. Maukah menikmati wisata-wisata yang menarik lainnya yang berada di Malang ?! Wisata Weekend Organizer Menyewakan Mobil Wisata, dimana Driver merangkap sebagai Guide yang telah dilatih dengan konsep Sapta Pesona Wisata, dan memiliki pemahaman terhadap obyek wisata yang akan dikunjungi. Kami menyediakan juga untuk pemandu international berbahasa asing yang siap memandu wisatawan asing. Harga tersebut sudah Include Antar Jemput Bandara/Stasiun/Pelabuhan, driver, BBM, Parkir dan TOL. Driver+Guiding Only lokal maupun berbahasa asing. Kami juga menyediakan paket wisata lainnya, atau silahkan sampaikan kepada kami jadwal obyek beserta fasilitas yang diinginkan, dan kami akan menghitungkan harga special untuk anda. Wisata Weekend organizer, Memasyarakatkan wisata Semarang dan Mewisatakan masyarakat Semarang. 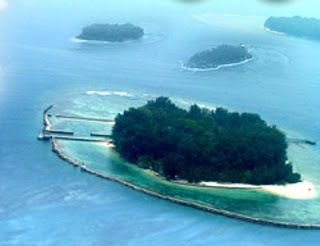 Masih penasaran sama tempat yang namanya Kepulauan Seribu nih...pengen berlibur ke kepulauan seribu. Nirwana tour and travel mempersembahkan paket paket wisata yang hemat bisa di sesuaikan dengan kebutuhan anda, Paket wisata dalam dan luar negri ₪ Tour organizer ₪ Meeting ₪ Karya wisata dan Perpisahan sekolah ₪ outing Perusahaan ₪ Umroh reguler dan plus, rent car, bus dan elf pariwisata. Nirwana tour and travel, Ruko puri nirwana III Blok ac – 15 karadenan, suka ati, cibinong – bogor, hotline : 0812 9436 3018 website : www.nirwanatourandtravel.com, email : nirwana.touryuk@gmail.com. Banyak pilihan wisata di Kota Jakarta memang sangat menggoda, mulai dari alam, kuliner, belanja dan yang bernuansa modern semuanya ada di Ibukota. jadi rugi klo gak jalan-jalan dulu untuk menikmatinya. Sama halnya dengan tempat wisata di bandung juga sangat beragam kadang bingung untuk mentukan pilihan saking banyaknya. Well, I am so excited that I have found this your post because I have been searching for some information about it almost three hours.And Jakarta is a very beautiful city which is part of Indonesia. memang Jakarta punya, seru nih destinasi wisatanya di jakarta..
Terima kasih telah memberikan informasi Objek wisata, karena indonesia sangat kaya sekali tempat wisata dan salah satu yang paling menarik adalah tempat wisata di bali dengan berbagai macam kuliner yang lezat dan enak.